Aimed at black and Asian students and graduates. To make your visit a success you need to prepare and plan. Look at the A-Z of exhibitors on the fair website and list the companies that interest you. Don’t rule out an organisation just because you have not heard of it before, read the details of the jobs on offer, there can be some unexpected gems. Research the company’s website. Look at their requirements and consider how you meet them, find out as much as you can about the organisation and the opportunities. Make a note of any concerns or queries that may occur to you. Look at the application procedure, if there is an online application form register and look at the questions that you will be asked. There is no point in asking a question which you could have answered yourself by reading the company’s website. You need to ask the types of questions that will give you the information you need to decide whether the organisation is right for you and to enable you to make a successful application. Start with your notes from your research. If you just miss an entry requirement, you could ask if it would still be worthwhile to apply. Maybe you would like to ask if it is possible to take a gap year and defer entry. If you are available for immediate start and late opening graduate jobs are not advertised on their website you could ask if jobs like this ever come up and if so how to find out about them. Is the organisation right for you? If you have strong feelings about ethics or the environment you could ask about the company’s attitude to these things. What makes the organisation stand out from the crowd? You need this information to help you explain in your application why you are applying to that company. These questions are best tailored to the person you are speaking to. 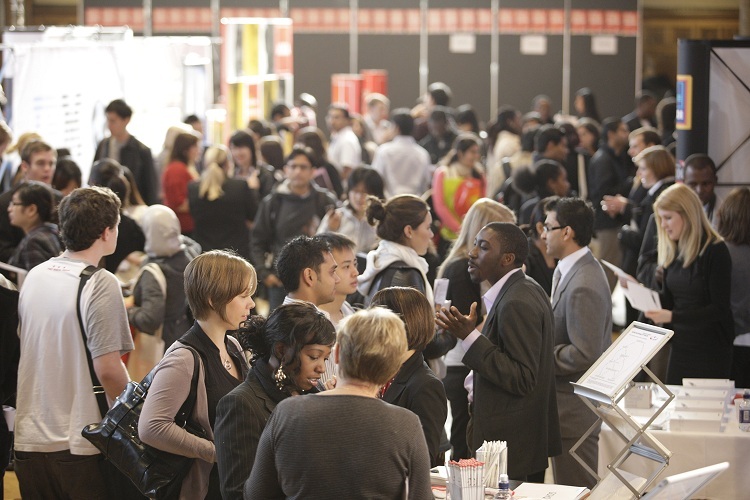 Organisations often send a mix of HR staff and recent graduate recruits to the fairs. Each will have different valuable insights to offer. Fairs can be anonymous, if you have a silly question it is better to ask at a fair than in your interview! Obviously this is not a good idea if you are leaving your CV or hoping to follow up with the person you are speaking to. Prepare a notebook with a couple of pages for each organisation and write out your list of questions for each. Leave space for notes on the day. Don’t forget to take a pen. Check your outfit – it is best to err on the side of smartness, you can’t go wrong with a suit. Decide whether to take your CV. Not many organisations will accept CVs at the fair, if there is an online recruitment process you will be expected to use it. However it can be useful to have copies of your CV with you especially if you are looking for niche or immediate start opportunities or if you are going to speak to an organisation that does not have an online system. Look at our CV advice to ensure yours is up to date, consider coming to a Quick Query session for feedback. Take your clean unfolded CVs in a folder so they look professional when you hand them over. Register in advance on the fair website to save yourself a few minutes when you arrive. Pick up a free fair guide on your way in. Look at the map of exhibitors and plan your route around the fair. If you have arrived as the fair opens start at the back of the room – most visitors go to the nearest stands first so they will be swamped whilst those at the back will be very quiet, and able to give you more attention. When you speak to a company representative make a note of their name and job title. They may give you a card, but if not write it down. You may wish to mention them later in an interview or application. Write notes immediately after leaving each stand while everything is fresh in your mind. There is one final fair this term for students and graduates wanting to take a postgraduate course, it is attended by universities, funding bodies and advisory organisations. NOT a jobs fair for postgraduates, but not to be missed if you are considering postgraduate study as your next step.